A collection of my 3D graphics experiments. Some older projects on the second page. Many of my Haskell and Rust projects are also graphics related. 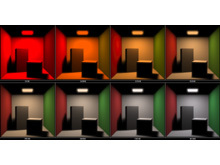 A framework for experimenting with product importance sampling, HDR environment maps, QMC and various BRDF models. This was originally started to investigate the excellent Importance Sampling Spherical Harmonics paper and compare it to some other product sampling approaches. 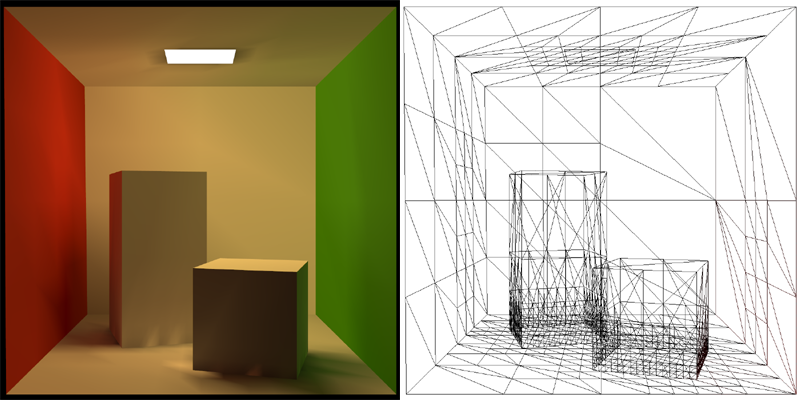 Comparison between analytic BRDF sampling, environment CDF inversion, Multiple Importance Sampling (see Veach's Thesis) and product sampling using hierarchical sample warping on an SH representation of the BRDF. There are more promising solutions for product sampling (see Claberg, Jarosz and Ramamoorthi). Debug displays showing the SH basis and the Shirley97 disk-to-square mapping can still be seen. 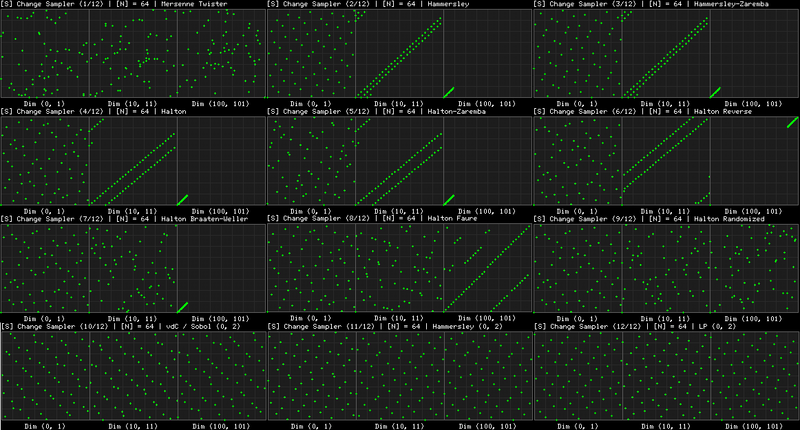 Some experiments with (t, m, s)-Nets and other low-discrepancy sequences. Van der Corput / Sobol and the Larcher-Pillichshammer (0, 2)-Sequences (Efficient Multidimensional Sampling) and various schemes based on the Halton / Hammersley pointsets with digit perm. 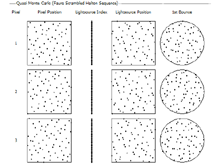 schemes (Good permutations for scrambled Halton sequences) and random permutations (Random and Deterministic Digit Permutations of the Halton Sequence). 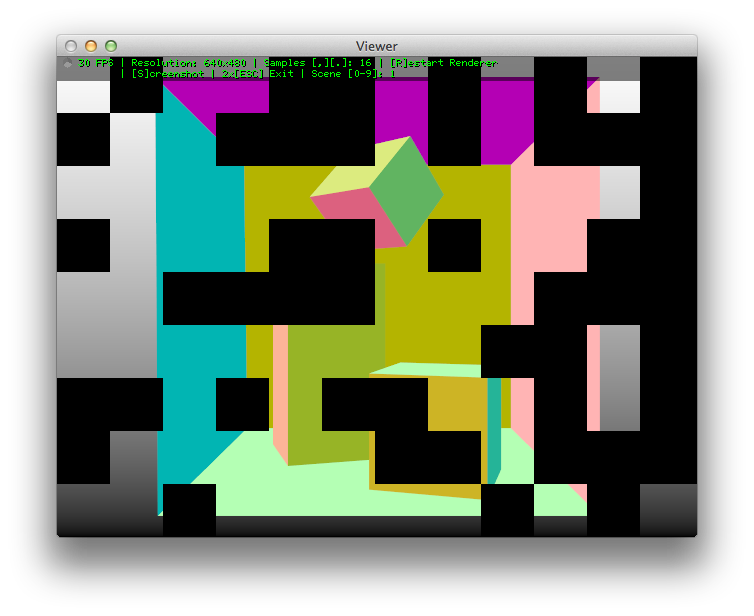 It's an OpenGL application running on OS X with GLFW. 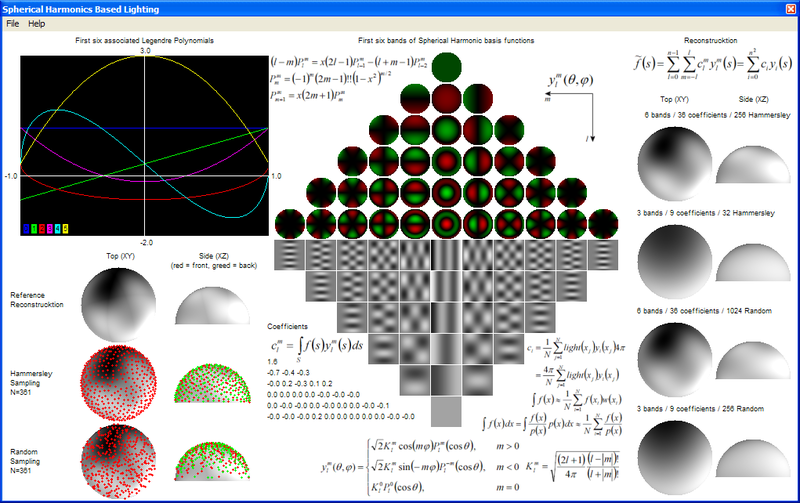 There's a framework for plotting spherical functions, samples and images in various projections and it all updates nicely in realtime. AntTweakBar is used for some parameter editing. 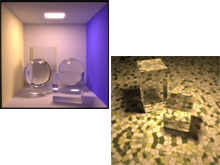 HDR environment sampling using simple numeric inversion of the 2D CDF (see Monte Carlo Rendering with Natural Illumination). 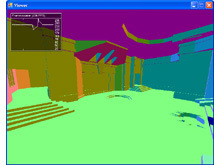 The first environment map is generated by an analytic sky model (see A Practical Analytic Model for Daylight). Other environment maps curtesy of Paul Debevec. Some early experiments with Sparse Voxel Octrees (SVOs), out-of-core mesh processing (Isenburg and Lindstrom have some fantastic papers on this), efficient disk I/O and caching, streaming of PLY files and designing better disk representations for large meshes. This was mostly inspired by Jon Olick's SIGGRAPH talk. I also have some ideas about dumping out shading grids from a REYES renderer and converting them to a voxel representation. This is still work-in-progress, mostly the pre-processing tools have been written. 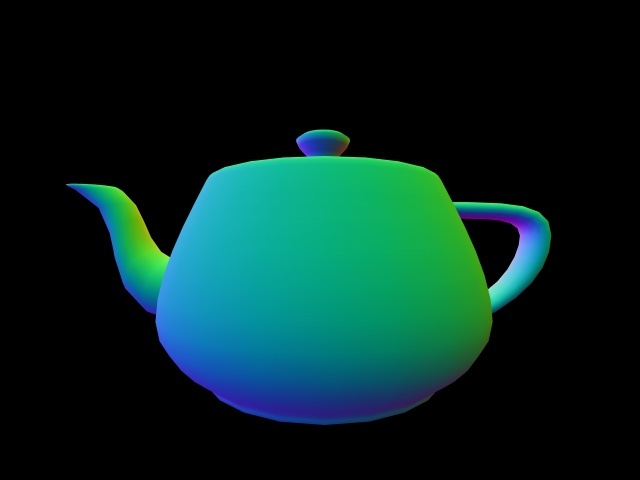 This is a radiosity system I implemented. 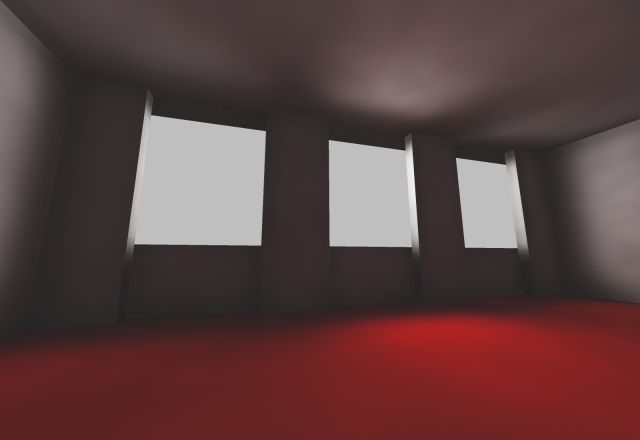 It consists of three programs: A meshing application using various D3DX functions from the August 2005 DirectX SDK, a radiosity solver based on code from my physically based rendering experiment and a viewer using OpenGL / GLSL. All light transport is computed with spectra instead of normal RGB colors. Measured geometry and emission / reflectance spectra from the Cornell box have been used. The result of the simulation is stored per-vertex and can be displayed in realtime. The PRT mesh refinement functions of D3DX turned out to be not very suitable to generate a good mesh for the radiosity solver. 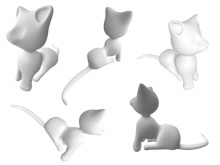 Meshing functions which can optimize for one set of known light sources would give likely better results. 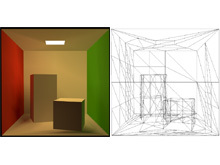 The book Radiosity and Global Illumination is an excellent introduction to the radiosity method. 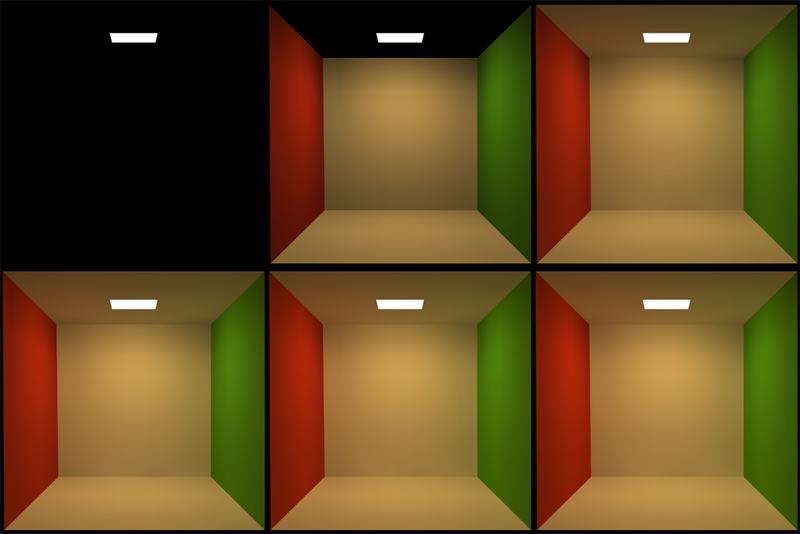 First six iterations of the radiosity solver for a simplified Cornell box. Computation time is a few seconds on a 3Ghz P4. Subtle color bleeding effects can be seen on ceiling and floor. 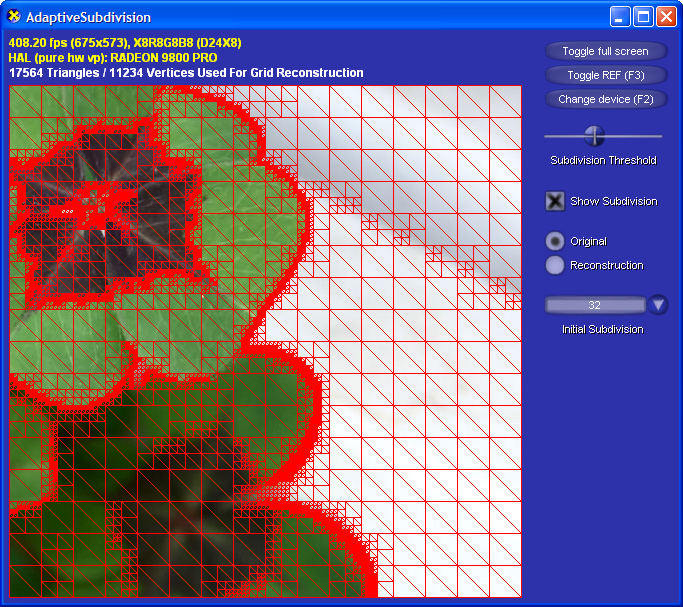 Normalization has been used for tone mapping. High exposure causes the light source to go white. 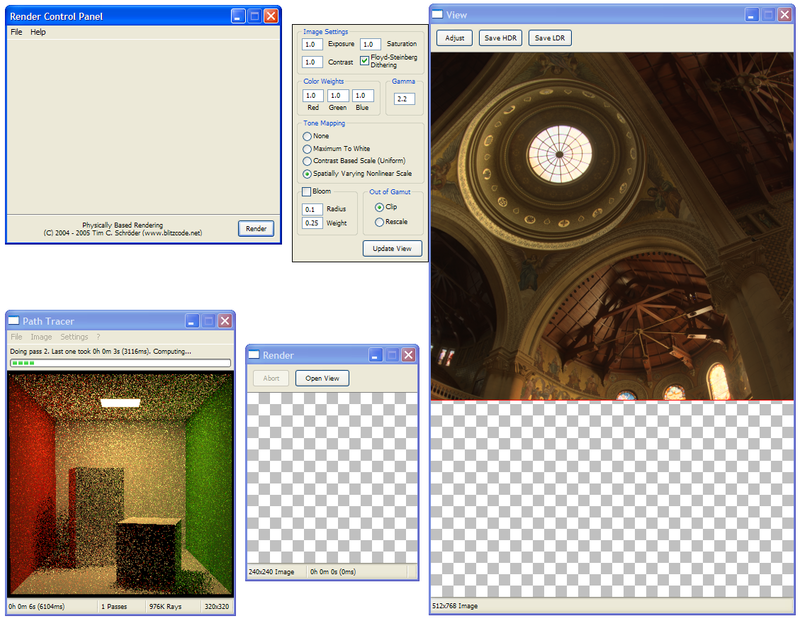 The radiosity mesh used in the pictures above. Since the scene contains no shadow discontinuities a simple uniform tessellation using D3DXTessellateRectPatch() provides acceptable results. The subtle darkening supposed to appear along the edges of the box can't be captured by the coarse mesh. The full Cornell box. Artifacts around the shadow discontinuities are caused by the uniform and low tessellation. 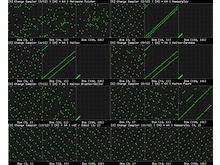 1548 triangular patches and six iterations have been used in the simulation. See here for the reference rendering from Cornell University. 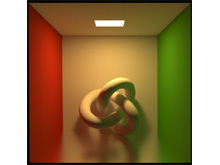 This radiosity mesh with baked in illumination is available for download. 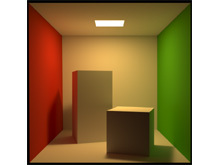 Radiosity solution computed on a mesh refined by using ID3DXPRTEngine:: ComputeDirectLightingSHAdaptive(). This tessellation did not do a good job at capturing potential discontinuities and appears rather random. The base mesh used was the Cornell box with holes in ceiling and floor, aligning tightly with the light source and the blocks. This mesh was computed by ID3DXPRTEngine::RobustMeshRefine(). The tessellator did a decent job refining around the two blocks on the floor and nearby walls. The area below the blocks and behind the light source is overly tessellated because the base mesh did not have holes for the light source and blocks as in the image before. No more over tessellation with proper holes in the base mesh for the light source and the blocks. 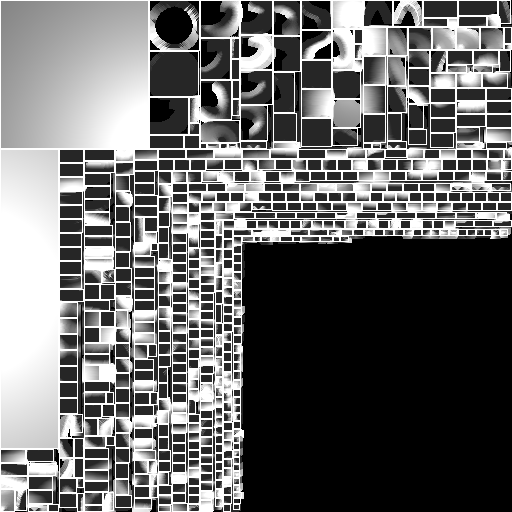 Here RobustMeshRefine() fails to refine the mesh enough. The API does not provide a way to increase the refinement any further. Calling it several times on the mesh did not yield good results. An ambient occlusion (AO) pre-processor I implemented. 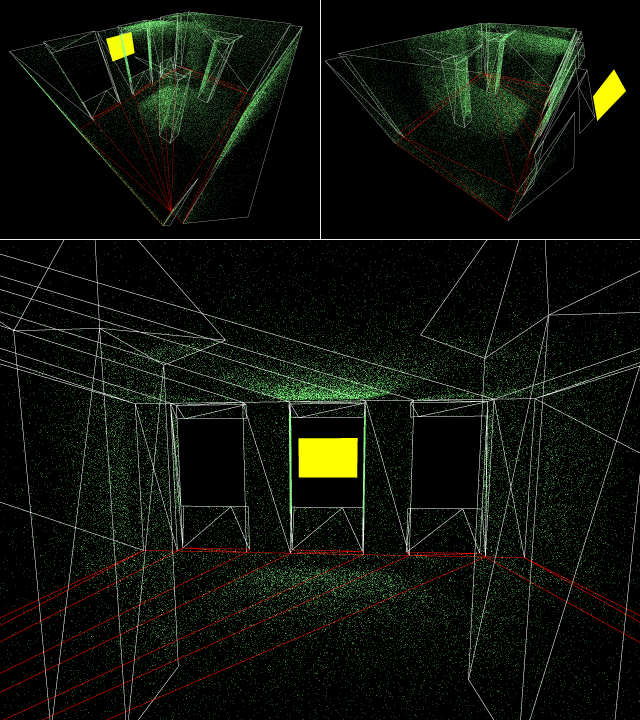 The accessibility of each mesh vertex is computed as a pre-process. It is encoded by scaling the normal of each vertex. This removes all runtime cost from AO because no extra storage or computation is required. It also enables renders which were not written with AO in mind to render these pre-processed meshes. 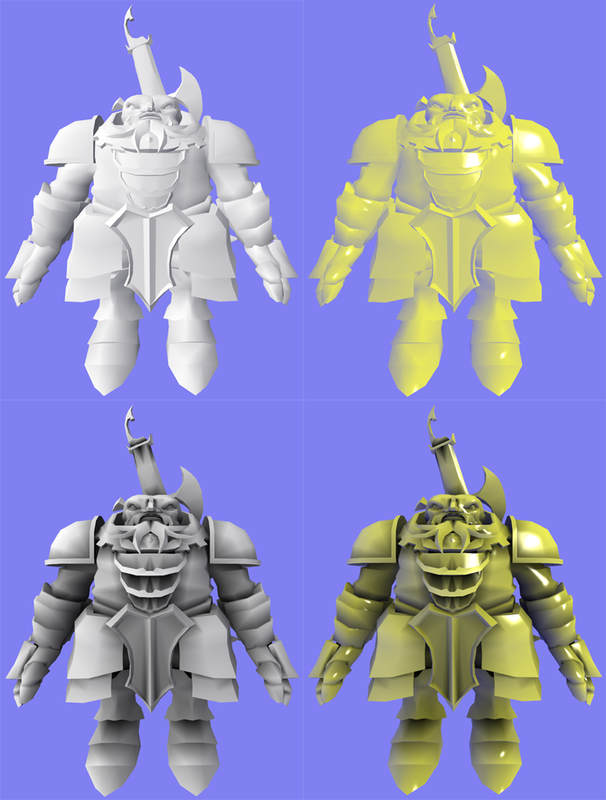 The 'Dwarf' mesh from the DirectX SDK rendered with a Gooch and a wrap lighting shader. The lower images take the accessibility into account and have a more realistic look. 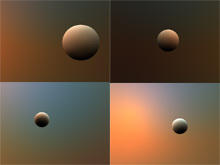 Another mesh with the same four shaders. Pre-computation time for the meshes shown here is just a few seconds. Realtime display of the meshes is done using OpenGL and GLSL. 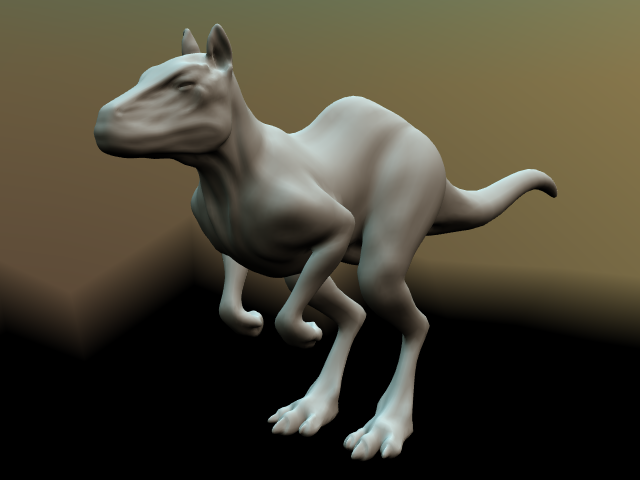 This mesh with baked ambient occlusion is available for download. The offline process for computing the ambient occlusion is implemented with the raytracer of my physically based rendering experiment. Sampling works by warping Hammersley samples on a hemisphere and then rotating them into a basis formed by the normal of the surface. If you got no clue what this is about, there's an excellent introduction level article by Robin Green available here. Also check the entries on Mathworld and Wikipedia for a more general and mathematical description. Two of the leading researchers in that subject, Ravi Ramamoorthi and Peter-Pike Sloan have lots of more advanced material. 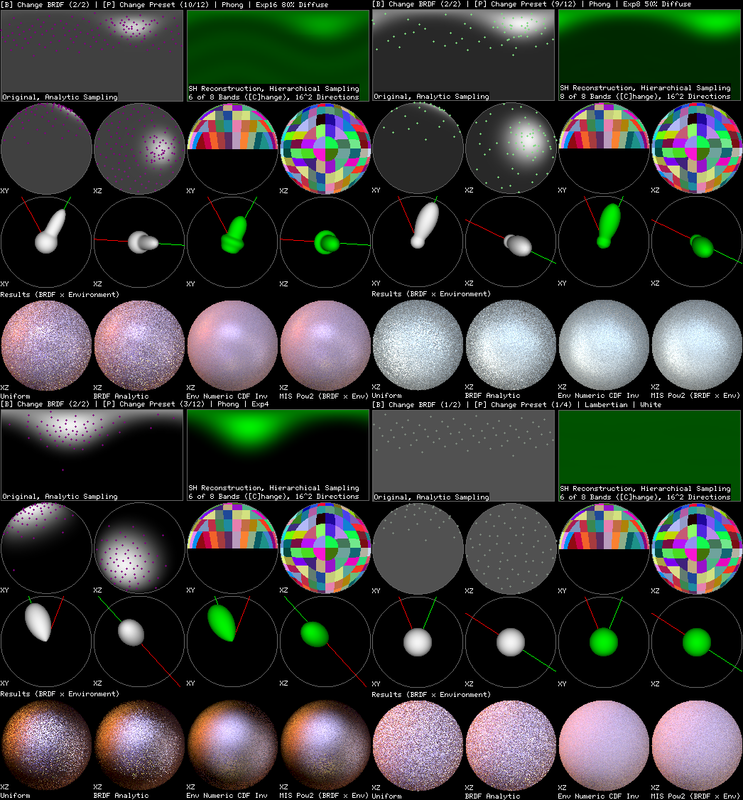 Precomputed Radiance Transfer (PRT), SH Irradiance and Relighting are a rather new topic in realtime computer graphics, but there's already plenty of fascinating material out there. 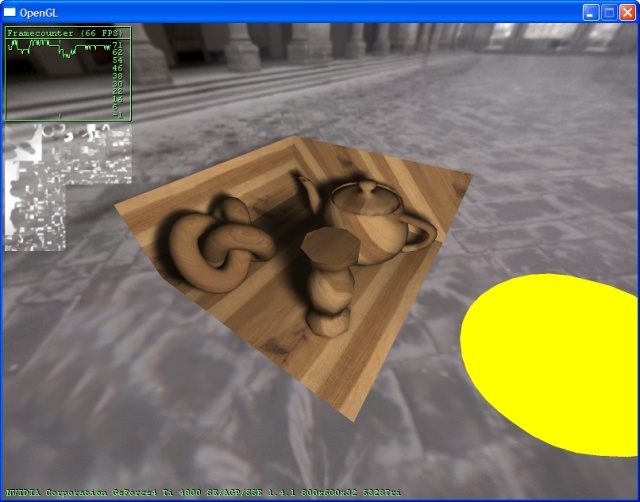 SH and PRT are also features of the D3DX library in the DirectX SDK. The program shown in the first picture is available for download. A test program I wrote which implements the entire sampling / coefficient extraction / reconstruction pipeline. On that picture it only approximates a hemisphere lit by three point lights and some SH basis function, but any sophisticated global illumination algorithm could be plugged in. A sphere lit by an environment map using a 4 band (16 coefficients) SH approximation. The physically based skylight model used to generate the environments was implemented by my friend François (Main author of Toxic). 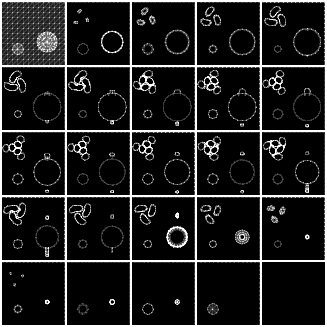 A test framework for comparing spherical basis functions. 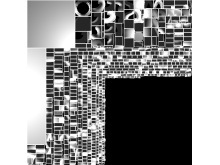 The functions being compressed / reconstructed are taken from cubemap images. The environment map used in the picture is courtesy of Paul Debevec. A more complex mesh lit by an dynamic skylight. Rendering is done with Direct3D and HLSL. Mesh courtesy of Headus. Credits for exporting and fixing it up go to my friend Carsten. Work in progress of SH based soft shadows. The simple mesh is lit by a small disc-shaped area light. Occlusion is stored as 64 coefficients (8 bands) quantized to 8 bit each. 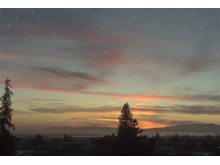 In the image various banding, ringing and quantization artifacts are visible. Credits for the raytracer used to compute the occlusion also go to François. This is part of the algorithm described in the paper Wavelet Importance Sampling: Efficiently Evaluating Products of Complex Functions. The paper describes a wavelet based method for multiple importance sampling which includes a clever hierarchical sample warping algorithm. 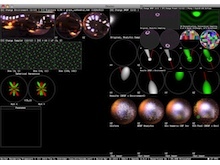 I use it here to warp the Hammersley low discrepancy QMC sequence to follow the luminance of an HDR environment map. The warping method is very fast and can be implemented in a few hours. 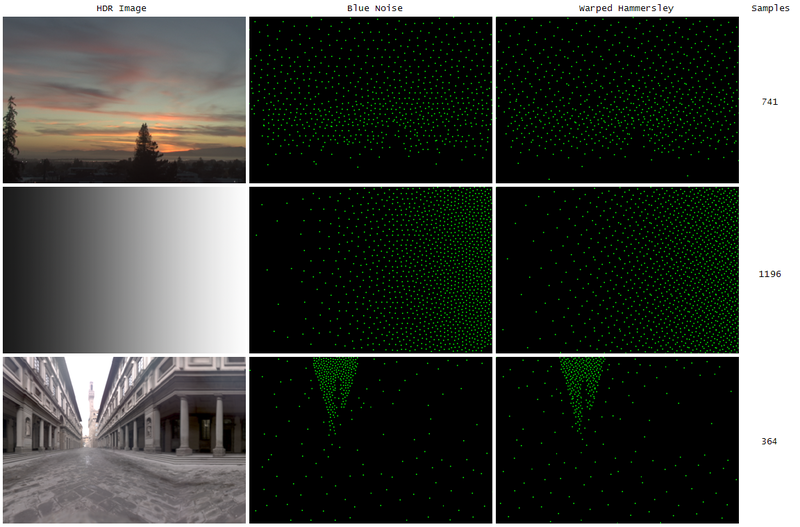 The test program also includes the implementation of blue noise tiling presented in the paper Fast Hierarchical Importance Sampling with Blue Noise Properties. The HDR images used are courtesy of Paul Debevec. The algorithm nicely distributes the 64 samples over the bright parts of the image while preserving their stratified / low discrepancy nature. Notice how the typical Hammersley pattern is still visible after warping. 256 samples have been used here. 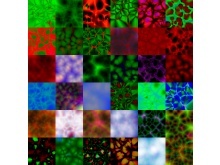 The samples here have been generated using the blue noise tiling. 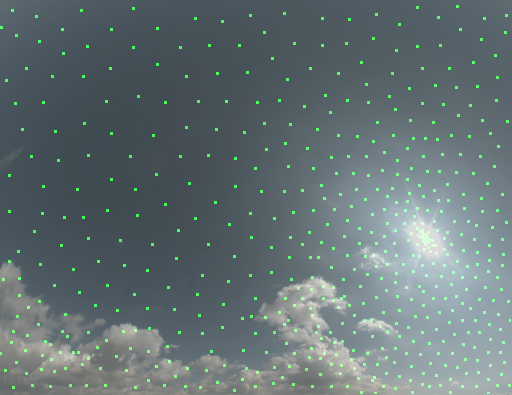 The bright sun is correctly covered with dense samples. 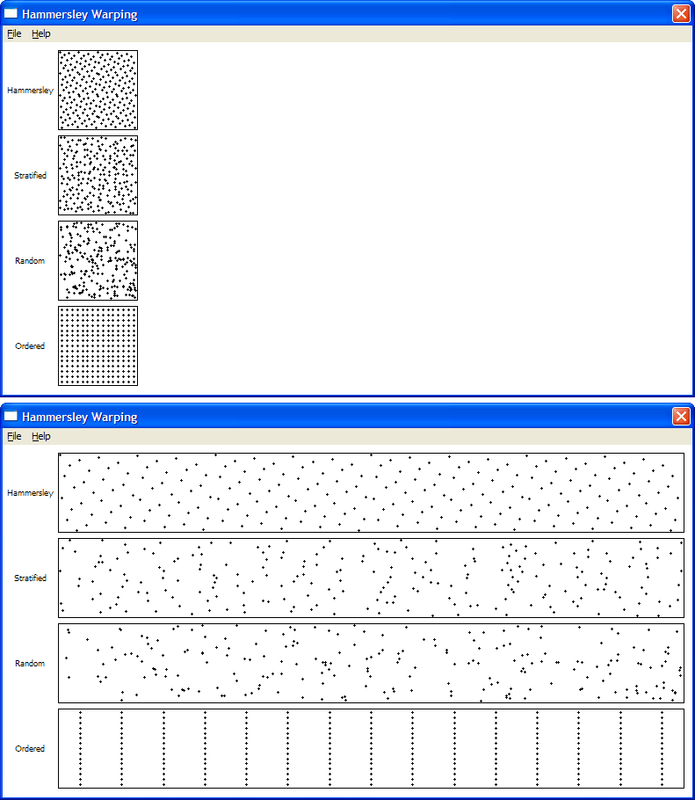 A comparison between the sample distributions generated by warped Hammersley and blue noise tiling. This is a simple triangle rasterizer with Gouraud shading, 16 bit depth buffering, clipping and backface culling. All rasterization and interpolation is done in fixed point. The idea behind this project was to provide a small and modular rasterizer that can be used for various pre-process / offline rendering tasks that can't be performed by a 3D accelerator. For example one might need floating point precision without relying on a D3D9 class card being present. 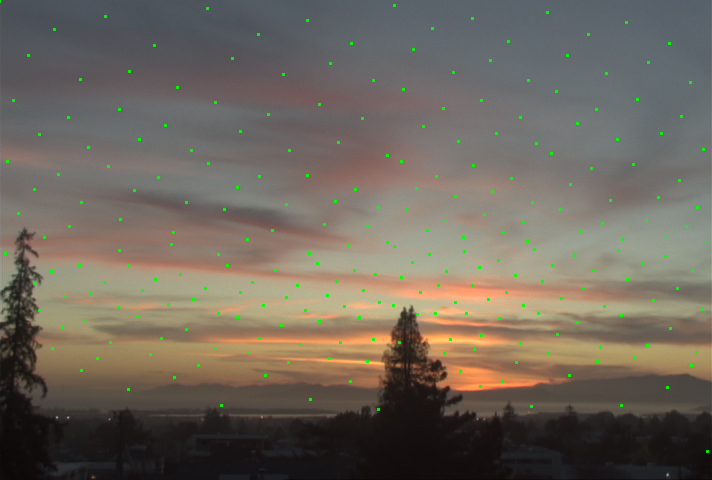 Another example would be a coverage buffer where every pixel touched by a triangle needs to be filled, not just the ones that have their center covered. 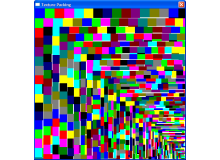 The entire rasterizer is contained in a single 500 line header file and has no external dependencies. Even though it wasn't intended for real-time rendering, it outputs a 2000 triangle model in 640x480 on a 1Ghz CPU at ~60FPS. One of the advantages that this software rasterizer has over hardware accelerators is the massive super-sampling. This picture has been rendered with 100 ordered grid samples per-pixel. 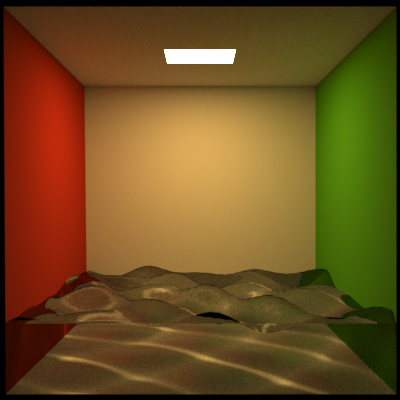 A path tracer implemented on top of code from my physically based rendering experiment. 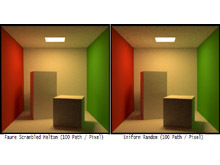 The renderer is using spectra instead of normal RGB colors for greater realism. Algorithms are kept unbiased and are implemented in a physically plausible way. 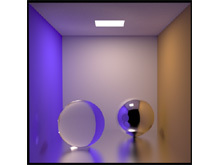 The path tracer mainly serves me as a test framework. Once a feature is working correctly it is ported back to the main codebase of the physically based rendering framework. All of the renderings shown here are at least partially based on the Cornell box data and measurements. The geometry, response / emission spectra and camera parameters have been used. 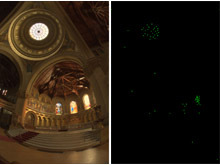 Differences between the images shown here and other renderings of the same data set are the result of different tone mapping, spectral representation and output color space. Some of the images also contain errors due to work-in-progress light transport algorithms. 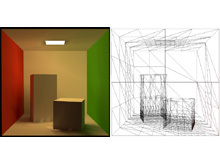 Excellent references for more information about path tracing and realistic light transport in general are the Physically Based Rendering book, the thesis of Eric Veach, Henrik Wann Jensen's book 'Realistic Image Synthesis Using Photon Mapping' and the publications of Alexander Keller. 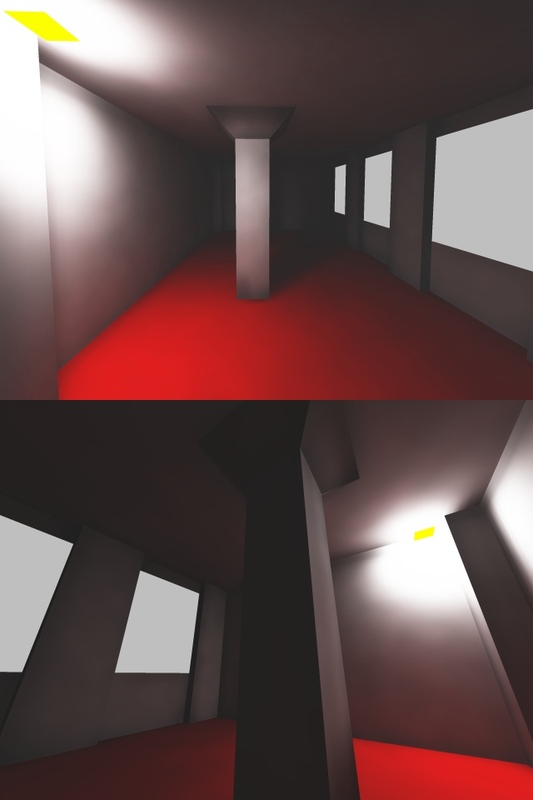 A few early and simple renderings: lit (left), shadowed (center) and soft-shadowed (right). 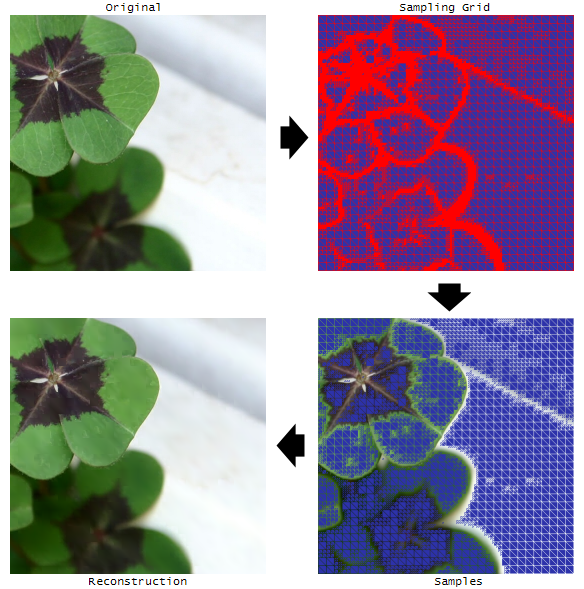 The reconstruction filter for anti-aliasing is a Gaussian. 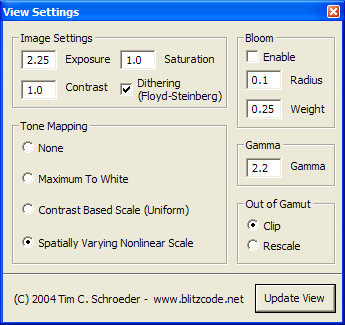 Mitchell, Box and Triangle filters are also supported. Tone mapping has been done using an integrated version of my HDR Imaging tools. 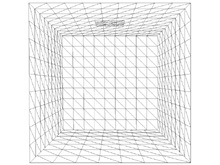 The ray acceleration structure used is a 3D grid. 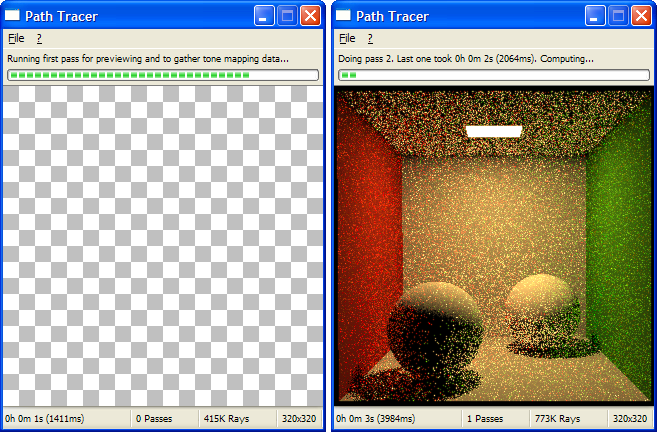 The GUI of the path tracer (done with Shiny). At startup a quick low-quality pass is done over the scene to gather tone mapping data and to offer a first preview. After that the unbiased renderer continues to add more passes. The variances reduces and the image converges. 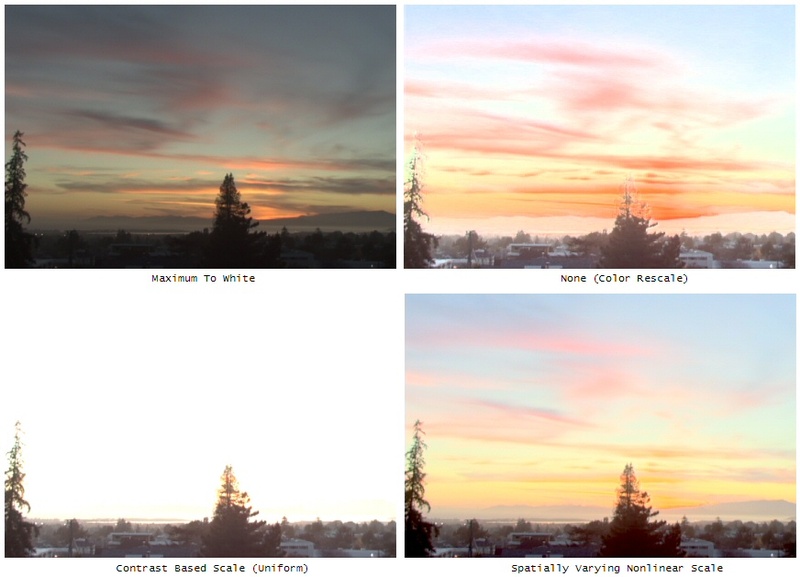 An in-progress HDR image is optionally written after each pass. 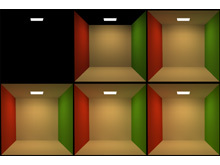 Rendering of the original Cornell box. All reflectors are perfectly diffuse. Color bleeding from the walls can be seen. Compare to my Radiosity renderings of the same dataset. The reference rendering is available here. This image shows how the illumination changes when a limit for the maximum path depth is set. 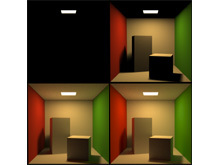 The first image in the upper-left corner shows only emissive surfaces while the one in the lower-right allows up to two bounces of indirect light. 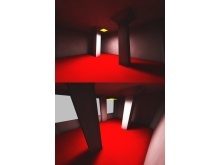 The actual renderer uses russian roulette to terminate paths. Here the light source has been replaced by a black body radiator at temperatures ranging from 550K to 6500K. See this rendering from Maxwell Render for comparison. All images have been toned mapped separately. It is hard to put them correctly into relation because of the very large intensity range. Fully raytraced motion blur. 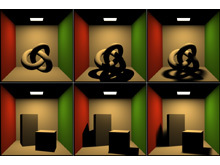 A spinning Cornell box (left) and a torus knot spinning inside a Cornell box (right). It's expensive to compute motion blur this way but also simple and general. All features like shadows and indirect lighting are taken into account. 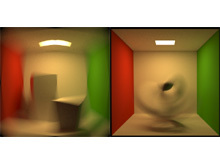 Here is an old realtime OpenGL motion blur implementation I did. Camera depth of field effects. The plane of focus is on the right background sphere, moving the left foreground sphere out of focus. This is actual 3D DoF, similar to the motion blur before. 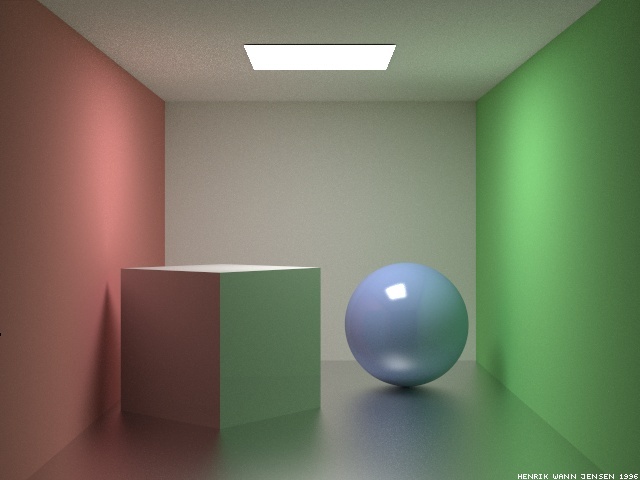 This image shows purely specular reflection and transmission. 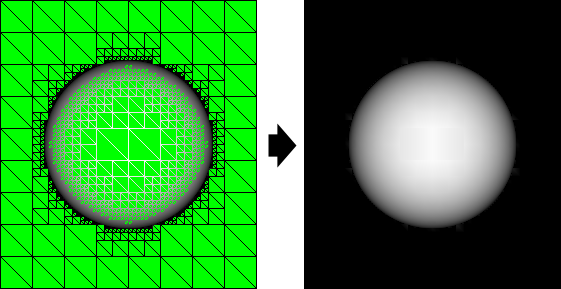 Caustics are visible below the left sphere and on the red wall. Here is a similar image rendered by Henrik Wann Jensen. Cornell box with glossy floor. 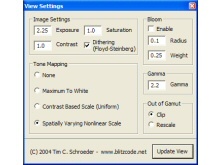 The reflection model used is the Blinn microfacet distribution. 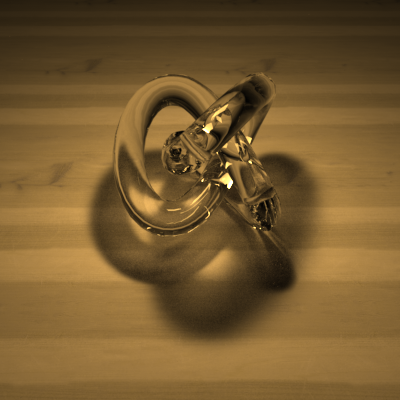 The artifacts on the torus knot are due to the shading normal vs geometric normal mismatch. Here is a similar image rendered by Henrik Wann Jensen. 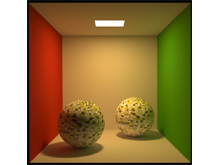 Two diffuse spheres inside a Cornell box which have their reflectance specified by a 2D texture. The texture is a normal RGB image converted to spectral data at runtime. Lookups are done with simple bilinear filtering. A water surface making nice caustics on the floor. Compare to this similar image. The fact that the water is just a surface and not a volume makes this scene invalid / non-physical. The water is also not using the dielectric Fresnel material but is purely refractive. Another sampling related program I wrote. I wanted to compare several variants of the Halton sequence for higher dimensional integrals common in 3D graphics. I implemented the Halton sequence with normal and with folded radical inverse (Halton-Zaremba). 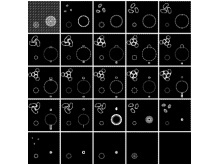 I also implemented Braaten-Weller scrambling to reduce correlation for higher dimensions. The permutation table used was taken from Good permutations for scrambled Halton sequences in terms of L2-discrepancy. 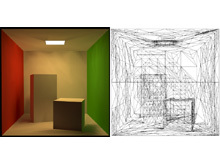 The publications of Alexander Keller and the free sample chapter 'Sampling and Reconstruction' of Physically Based Rendering are great resources for those who want to learn more about low discrepancy sampling. The test program. It is available for download. 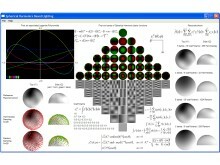 It shows the distribution of several sequences for a typical multidimensional integration problem in computer graphics. 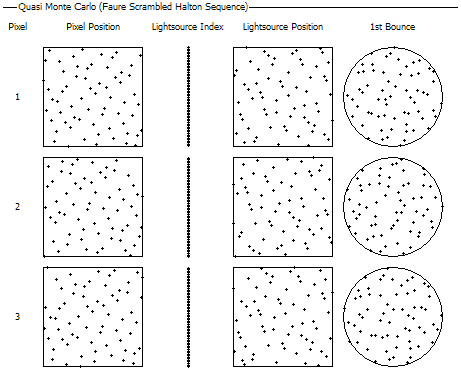 This image shows the first 64 samples of a Faure scrambled Halton sequence. See Keller's Monte Carlo And Beyond slide 96 or 'Production Rendering' by Ian Stephenson (Ed.) page 225 for reference. 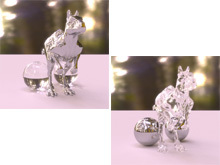 Two path traced images with 100 path per pixel. 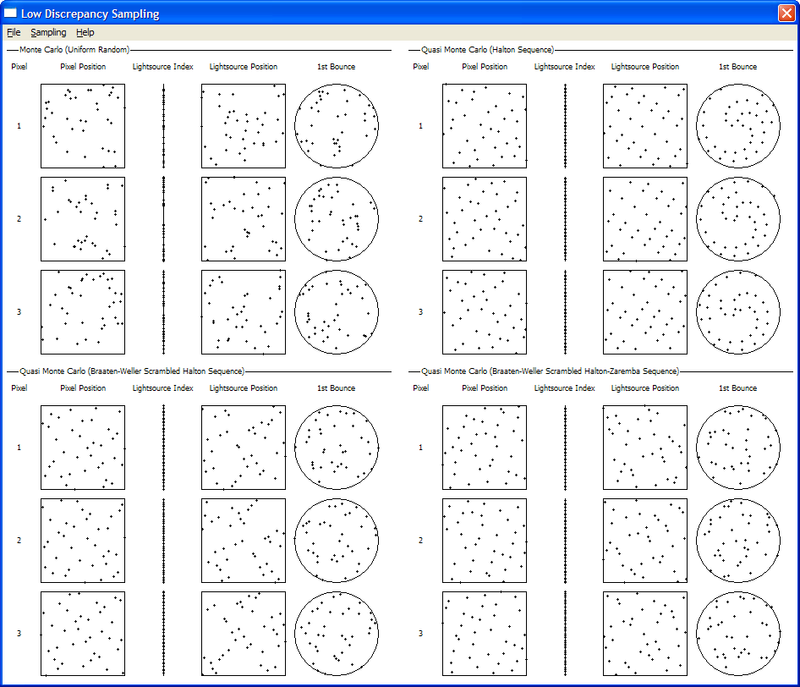 The left one uses a Halton based QMC sampler while the right one uses uniform random sampling. 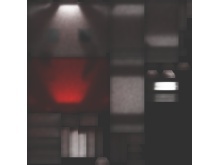 Notice how the QMC image has less noise, especially on the ceiling. A little test program I'm using for my GLSL experiments. It's a nice framework which supports Vertex Buffer Objects (VBOs), has GLSL support, smooth DirectInput based navigation and a nice 3D UI with configurable keys to select the mesh / shader. 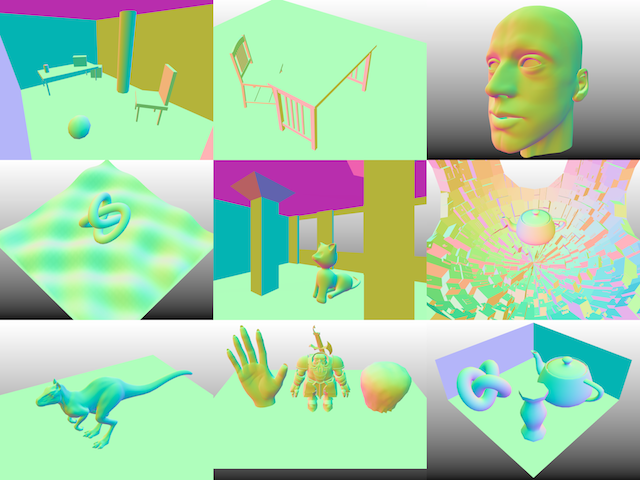 For more information about GLSL, have a look at the 3DLabs GLSL page or the OpenGL Shading Language Book. 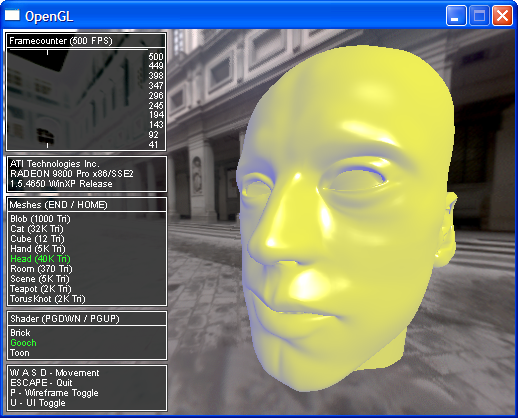 ShaderTech and the Typhoon Labs OpenGL Shader Designer are also worth a look. The test framework with an OpenGL port of my 3D UI Elements. 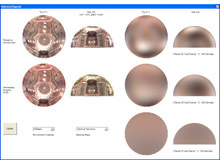 One can choose from various loaded meshes and shaders. 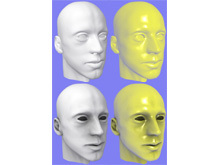 The head in the picture is rendered with a Gooch Shader from 3DLabs. A simple brick shader, also from 3DLabs. 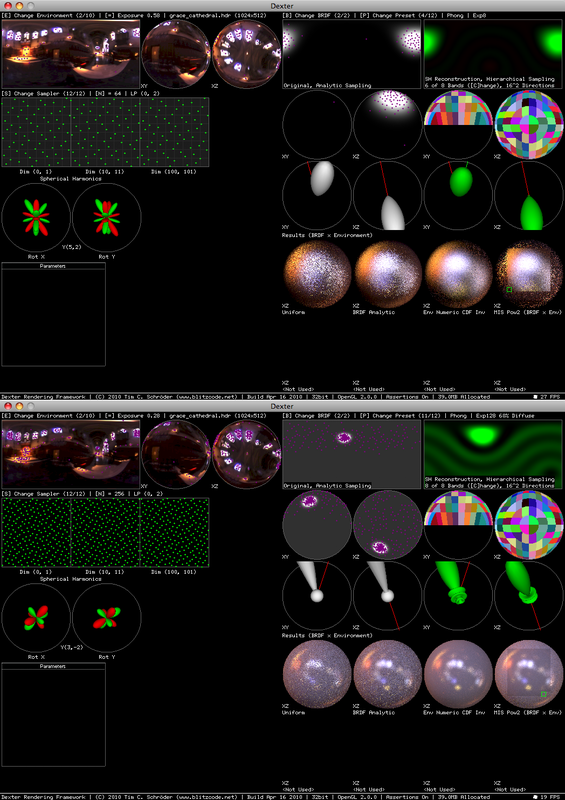 I tried to get more fancy, but at the time this program was written the GLSL support of nVidia and ATI was very early and complex shaders often triggered software fallbacks or failed to compile. A 'Wrap Lighting' shader. 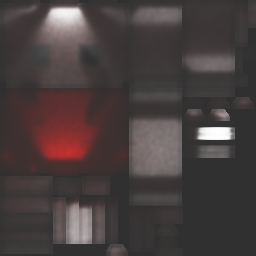 Gives the model a nicely shaded appearance even from direction where there is no light. Cat model done by my friend Wouter. 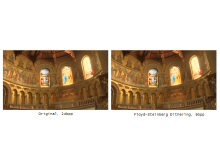 This is a tool I wrote to view and post-process high dynamic range (HDR) images such as the ones produced by a physically correct rendering system or HDR photographs. The images are loaded from Radiance image files. Have a look here for some HDR images from Paul Debevec. It supports the tone mapping algorithms described in Matt Pharr's and Greg Humphreys' excellent book Physically Based Rendering. Other features are adding bloom, gamma correction, Floyd-Steinberg dithering and exposure / saturation / contrast adjustment. The GUI of the program. Hitting 'Update View' renders the image asynchronously scanline-by-scanline with the new parameters. All Win32 and GUI code done with Shiny. An example of the Floyd-Steinberg Dithering. 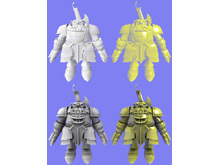 Normally used to dither down to 24bpp it is used here to create a 9bpp (3bpc, 8 shades) image. 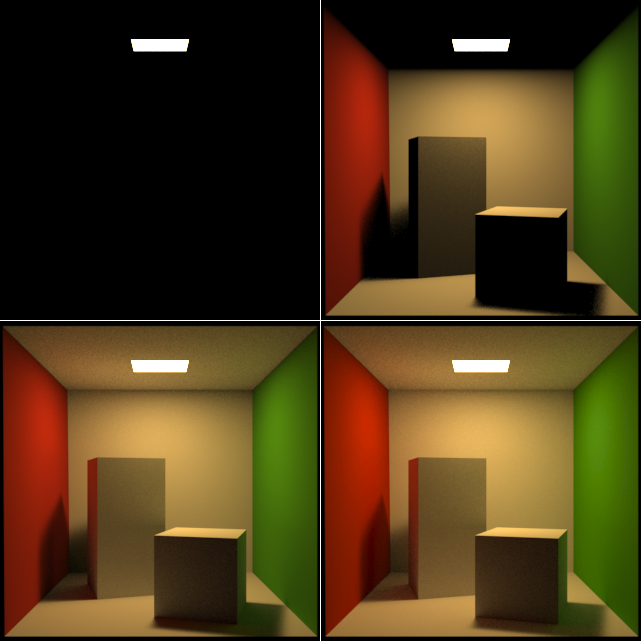 Comparison between different tone mapping algorithms. This is a difficult image because of the extreme difference in luminance between the sky and the ground. 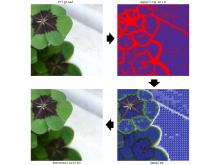 The 'Spatially Varying Nonlinear Scale' performs usually best, while sometimes on indoor images the 'Contrast Based Scale' looks better. 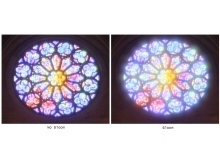 Bloom filter applied to a church window. It's somewhat slow to compute because of the large filter width. An early version of a physically based rendering system I'm working on. It's inspired by Toxic and PBRT, but doesn't reuse any of the actual code. The renderer is far from being ready, but progressing slowly. So far some of the foundation code for spectral rendering, sampling, filtering, HDR input / output, BRDFs, cameras (DoF, motion blur etc.) 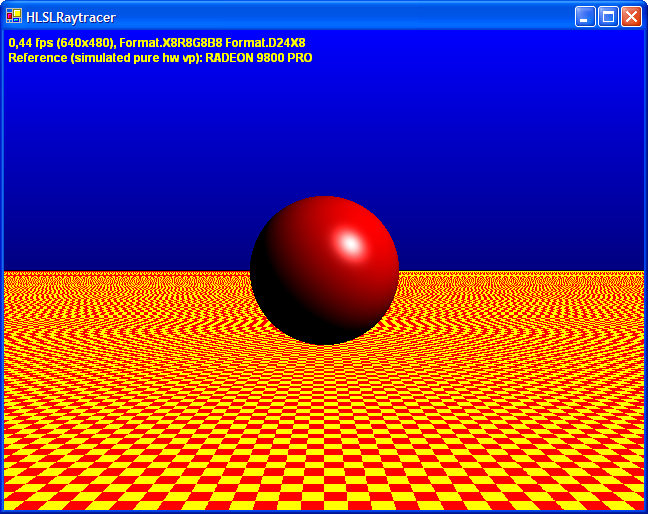 and ray tracing has been written. 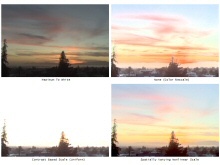 An improved version of my HDR Imaging tools are integrated. The GUI has been done with Shiny. 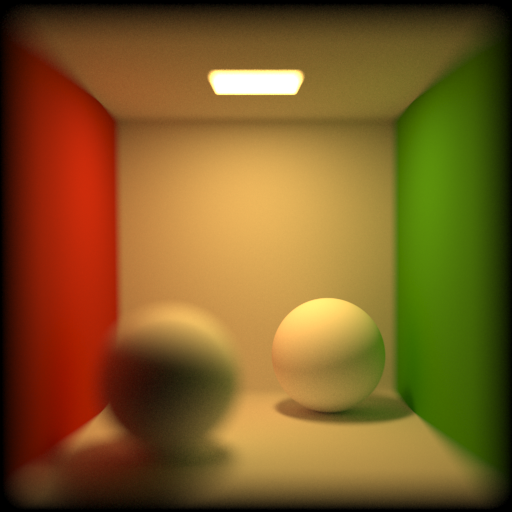 I implemented path tracing and radiosity using the base code of this framework. Some of the images contain errors due to the work-in-progress nature of the codebase. 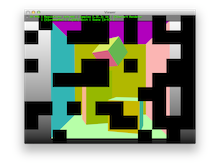 The test framework GUI for the renderer in an early state. On the right you can see the HDR image post-process. 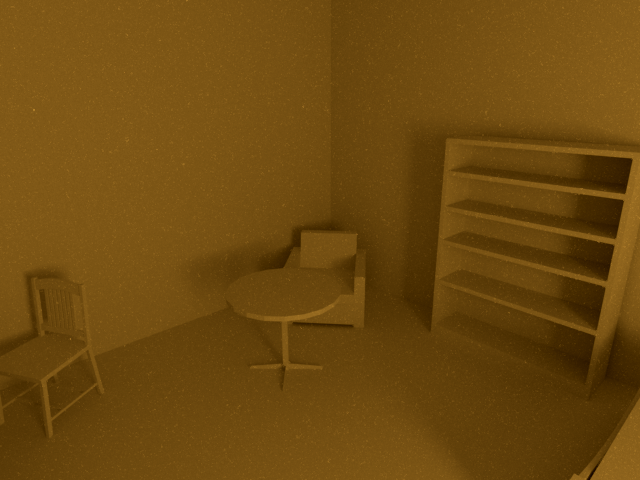 It's hard to debug a GI renderer when you don't have proper tone mapping. 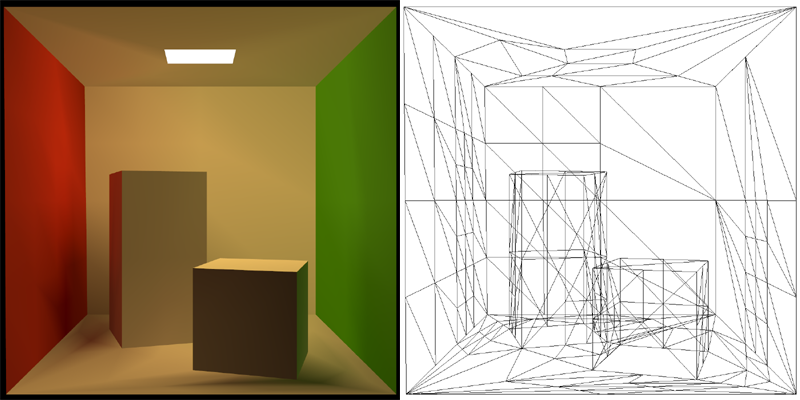 In the lower-left corner is a picture of a path tracer which is based on this framework. 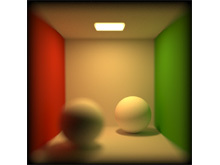 A Cornell box like environment with a glossy floor and two perfectly specular transmissive / reflective spheres. 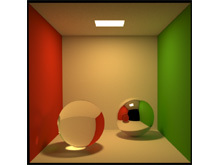 Caustics can be seen under the left sphere and on the blue wall. The light source is a black body radiator at a temperature of 5000 Kelvin. 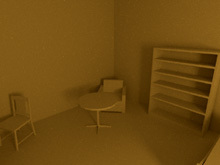 Rendering of a room scene taken from the WinOSI site. This image had some additional post-processing from Photoshop. The scene was slow to render as it contains a lot of indirect lighting. A torus knot made out of glass (index of refraction 1.5, dielectric Fresnel) casting shadows / caustics on a plane. The reflectance of the plane is specified by a wood texture. The light source is a square area light positioned above the torus knot. This image has been computed with over 26 billion rays. 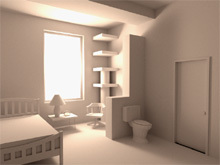 A rendering showing the part behind the camera of the room scene shown in an earlier picture. The strong indirect lighting is causing lots of noise. Even after dozens of hours of rendering and filtering the noise is still very visible. 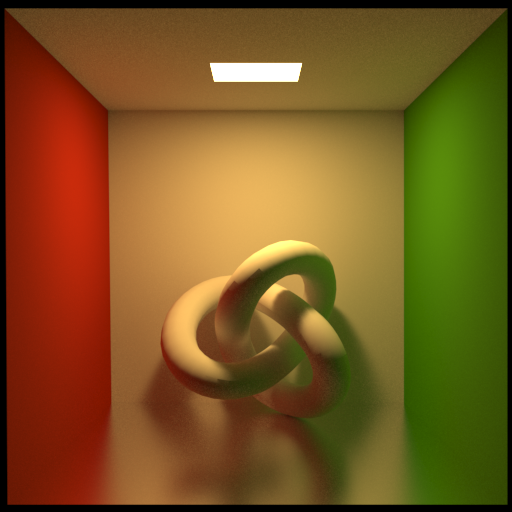 I plan to use better sampling, bi-directional path tracing and adaptive filtering to improve this. 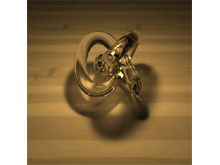 Two scenes containing objects made out of the same glass material as the torus knot above. 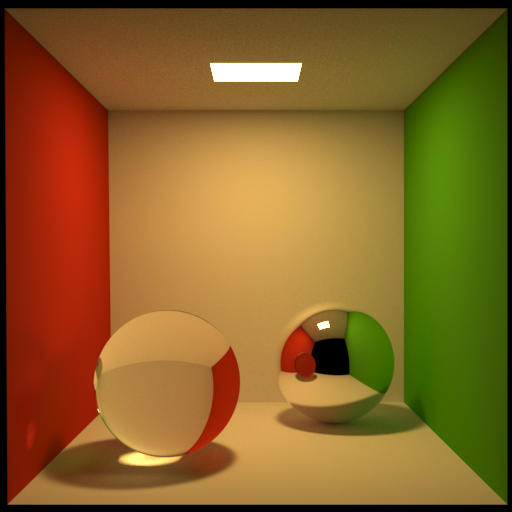 A complex mesh and two spheres on a plane illuminated by an HDR environment map. In the left picture the sphere is a made out of glass and the 'Killeroo' mesh is made out of steel. The right picture has the materials reversed. The left picture had some Photoshop post-processing to remove noise. I got the idea for this scene after seeing these renderings by Richard Rosenman. 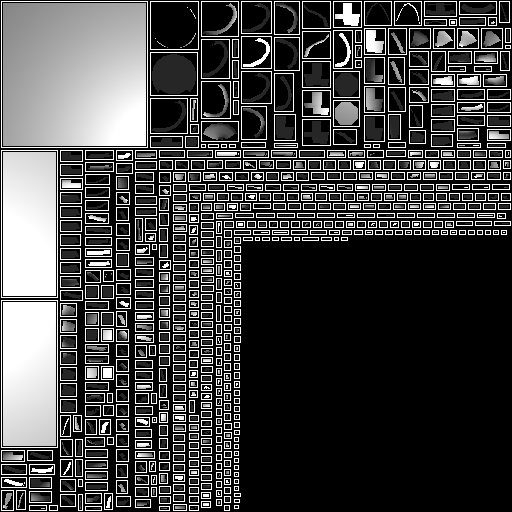 The geometry is generated by the Greeble plugin and exported from MAX. All the light is coming from the sky. I hacked up a little ad-hoc sky model based on my friend François' implementation of the A Practical Analytic Model for Daylight paper. This image has been computed with over 30K path/pixel. 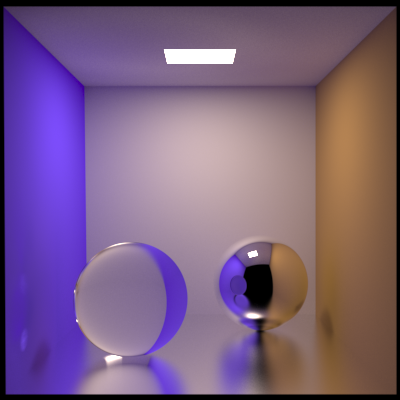 A simple GPU raytracer implemented fully in HLSL. 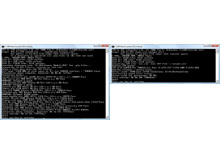 The host application is written in C# and does little more than drawing a quad covering the entire window. 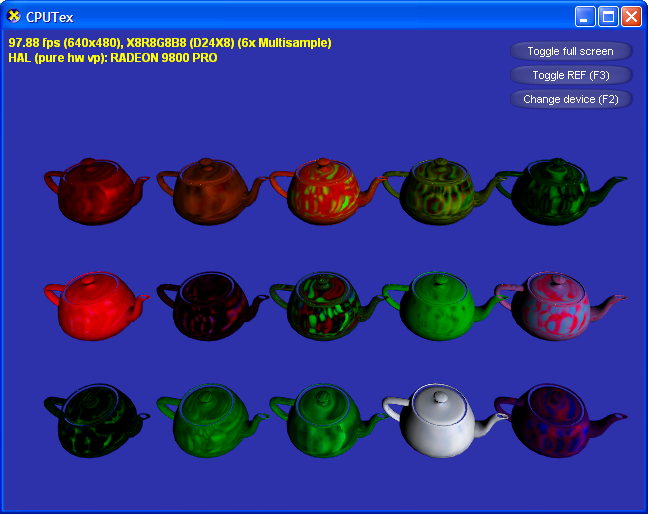 The managed / .NET version of the August 2005 DirectX SDK has been used for this little experiment. 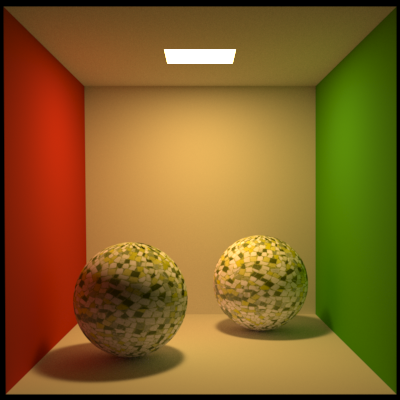 The Master's thesis of Lars Ole Simonsen ('A Comparison of Acceleration Structures for GPU Assisted Ray Tracing') has a more serious discussion of GPU based raytracing. A checkerboard plane and a phong shaded sphere in front of a gradient background. This is running on the reference rasterizer. 77 instruction slots are used by the ps_3_0 shader. It is hosted by a DXUT based application. For a simple sphere and plane scene ambient occlusion can be computed analytically. A little program I wrote to demonstrate that the Hammersley low discrepancy QMC sequence stays well-distributed when being stretched / warped while other sampling patterns like stratified sampling do not. The test program is available for download. 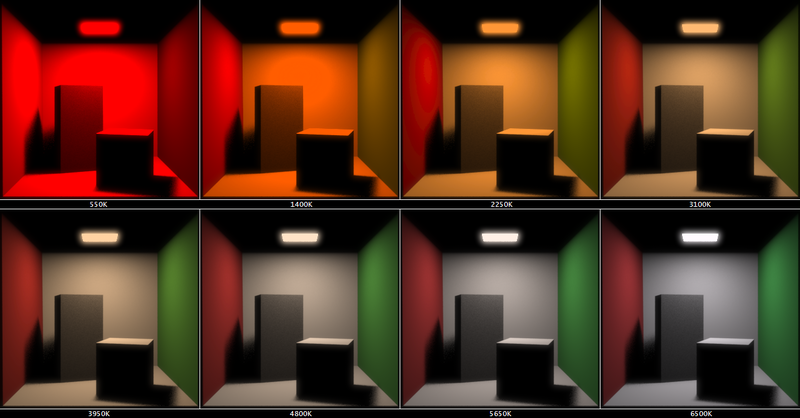 Have a look at my HDR Environment Map Sampling project for another example of sample warping. 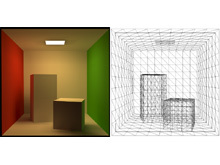 Photon mapping is a very powerful global illumination algorithm. 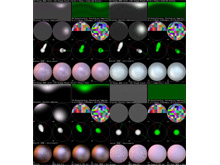 It is implemented as a 2-pass algorithm where the first pass traces and scatters photons from the lightsource through the scene and the second pass estimates irradiance on the surfaces by computing local photon density and energy. 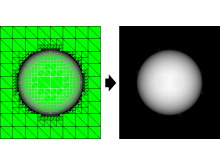 My implementation does a direct visualization of the photon map (no final gathering) and is strongly based on the explanations and sample code presented by photon mapping inventor Henrik Wann Jensen in his book 'Realistic Image Synthesis Using Photon Mapping'. I highly recommend looking at it if you want to learn more about photon mapping. Alternatively, see this site for a well-done and brief explanation. 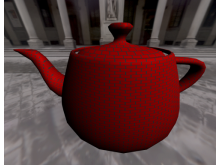 This photon mapping implementation has been licenced for commercial use. An architectural scene illuminated from the outside by a rectangular area light source. This image has been computed with 1M photons from the light source plus ~800K reflected ones. 500 photons are used in the radiance estimate. 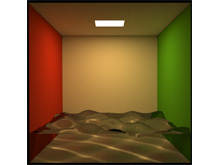 The 256x256 lightmap used in the scene above. 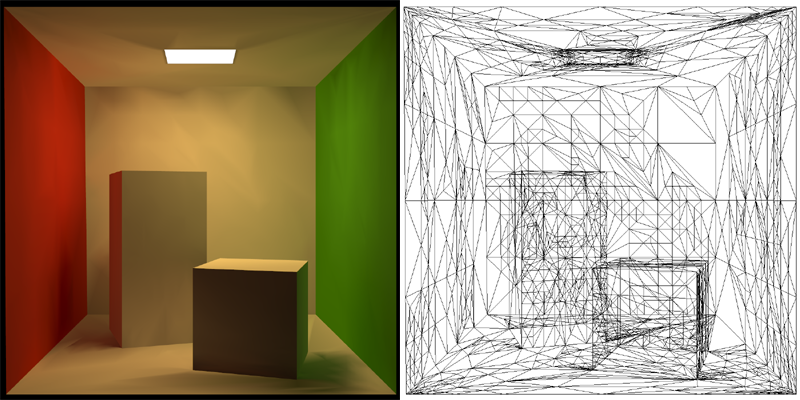 It is mapped, packed and rasterized using the same algorithm as my lightmap compiler. This is the 24bpp lightmap after tone mapping, but the HDR one can also be saved to quickly view the scenes with different settings. 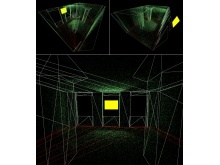 Notice the low frequency noise in the illumination on the surfaces of the scene. The photon map computed for the scene above. ~100K photons are displayed as green dots on the surfaces of the model. 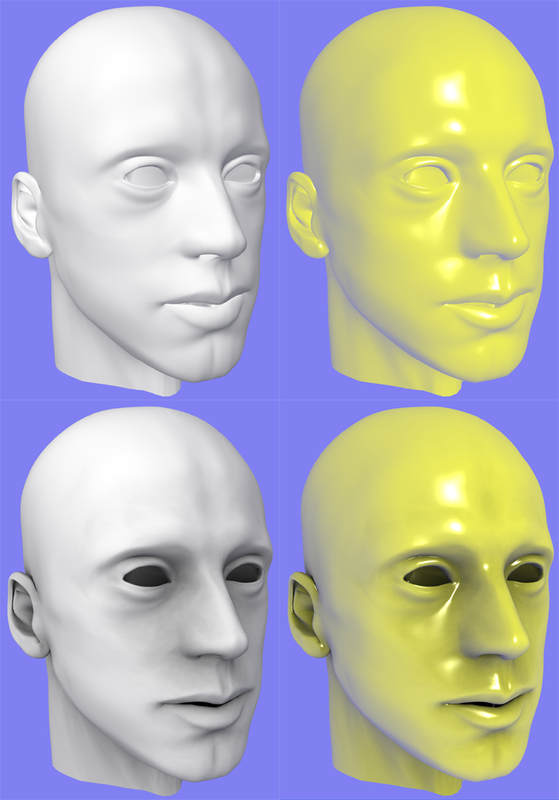 The light source is yellow, the line colors indicate the diffuse material color of the surfaces. 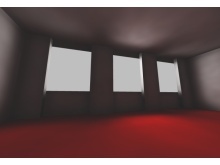 The red floor gives the walls a red tint by reflecting light from the small light source. 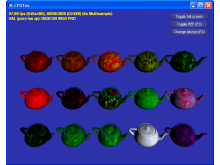 This effect is called 'color bleeding' and is an important part of radiosity simulation. The small area light in the corner softly lits the room through indirect lighting. The surfaces in the scene are all diffuse with a reflectivity of 50%, Russian Roulette has been used for the photon scattering. Smooth lighting across the entire room provided by a large area light source shining through the windows (light source not shown). 2M photons were used in this scene. 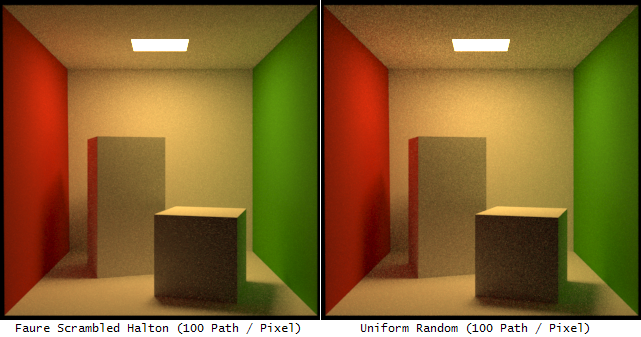 A program I wrote to develop the left balanced trees in my photon mapping implementation. 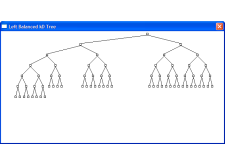 Such trees can be stored in a linear array - no need to explicitly keep pointers to the child nodes. This feature makes the representation extremely space efficient and well-suited to store kD Trees for Photon Maps. This paper has a nice explanation of the algorithm. Inspired by the book Texturing & Modeling: A Procedural Approach I decided to write a little implementation of cellular texturing, a method to generate procedural textures. A little demo is available for download. 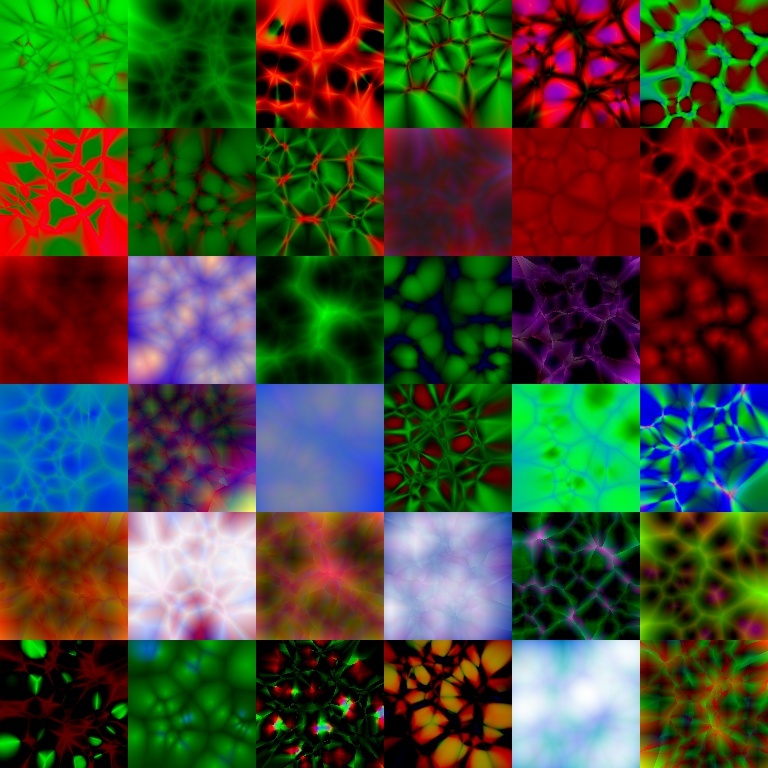 A small selection of the textures which the program randomly generates. For another project of mine I wanted to know how fast I can transfer data from CPU to GPU. This test program (Written with the DXUT framework from the October 2004 DirectX SDK) uploads a bunch of procedural textures every frame and renders with them. 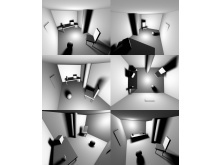 This is a test program for an adaptive realtime-raytracing (RTRT) algorithm. 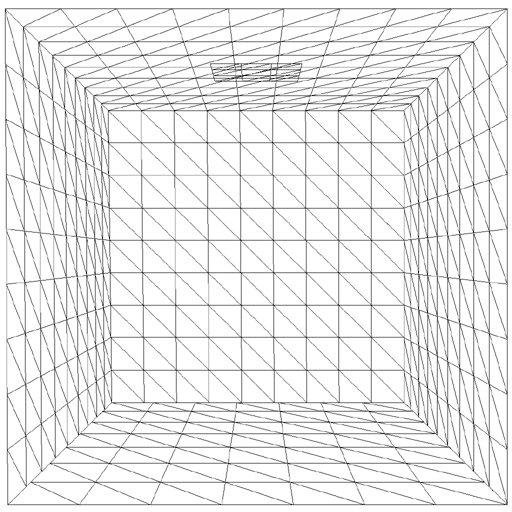 The image plane is sampled at fixed gridpoints. If the color values between four adjacent grid points diverge to much, the quad is split into 4 smaller ones. This is done recursively. The final set of sparse sample points is uploaded to the GPU as a triangle mesh. In this way the interpolation can be done on the GPU, where it's very cheap. Also further post process effects such as glare and blur can be added. One problem with this approach is the upload time for the huge triangle arrays generated. The impact of this can be reduced by having a tight encoding scheme for colors and 2D positions of the grid vertices. Another issue are the T-junctions which are introduced due to adjacent quads with different subdivision levels. This problem is not easy to fix when realtime performance is desired. The current implementation is very optimized, and will soon be driven by an actual ray tracer instead of the placeholder image / test ray tracer seen in the screenshots. See here for another RTRT using this approach. The test program. 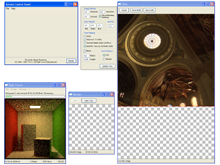 The nice GUI was done using the build-in facilities of the DXUT library from the December 2004 DirectX SDK. 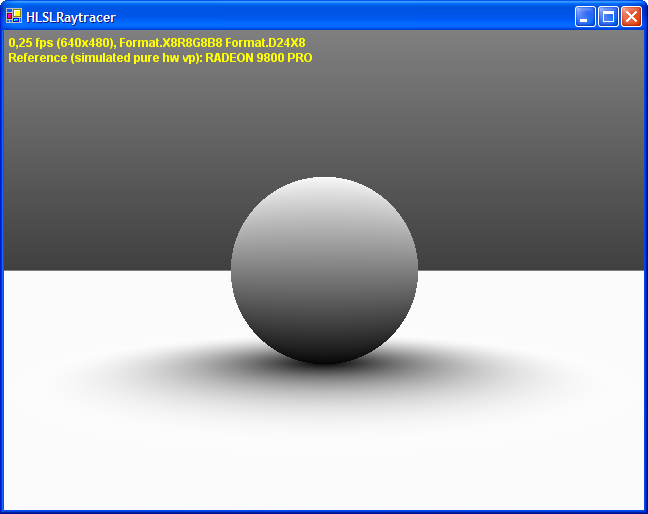 For the test program a static image is sampled instead of tracing rays. The basic algorithm. Note that step 2 and 3 are actually done interleaved because the way the grid construction progresses depends on the values of the samples. 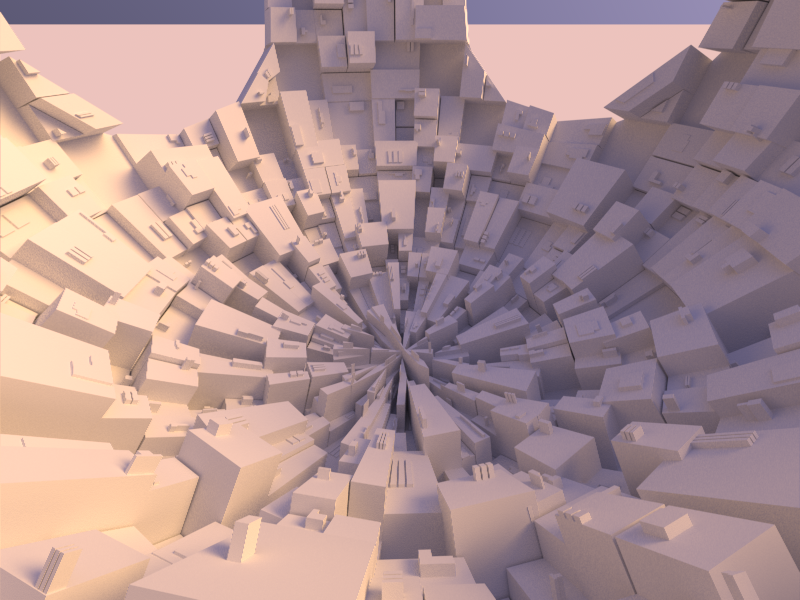 The subdivision code driven by a little test ray tracer. The sphere moves so I could make sure there are no artifacts with the subdivision for moving objects. This is a work-in-progress of a game engine written in C#. I started this project to get more fluent with C# 2.0, .NET 2.0 and managed Direct3D. Another goal was to get a nice framework for rendering and physics experiments. 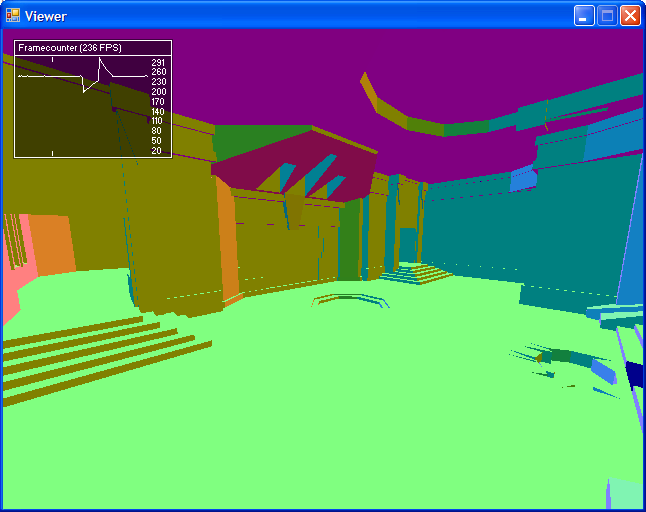 The engine can load Quake3 maps and models to get some data for testing and experimenting. All data is directly extracted from Quake3's PAK files. ZIP file handling is done with SharpZipLib. So far loading of Q3 BSP Files and MD3 Models is supported. A fair amount of framework classes for things like accessing system timers and smooth camera controls have been written. An XML based configuration system allows tweaking engine parameters easily. The input system also uses XML files to bind keys to actions. 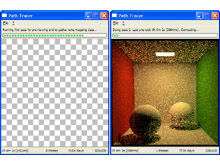 All rendering is done using managed Direct3D (April 2006 SDK) and the effect file framework. 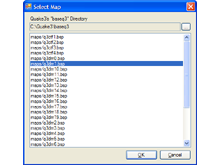 Screenshot of the Q3DM1 map. Rendering is still very basic and incomplete. A C# port of my 3D UI Elements is shown. 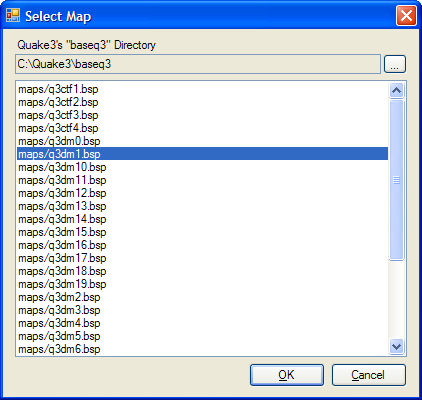 Simple WinForms 2.0 dialog for map selection. The list of maps is directly extracted from the PAK file. 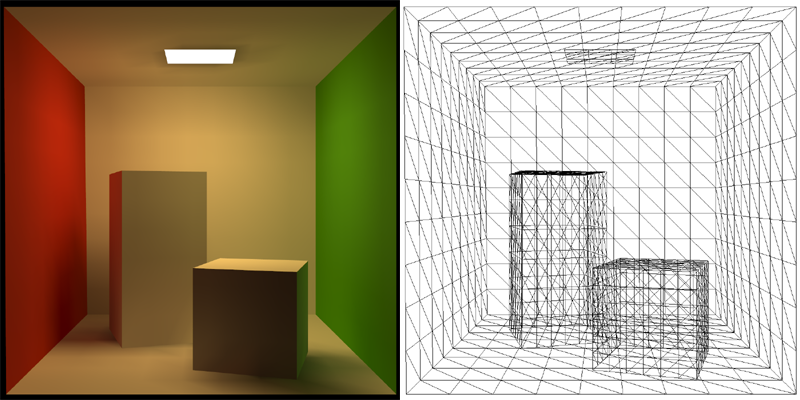 A lightmap compiler that does mapping, packing and lighting. It's basically a Quake style lightmap generator. 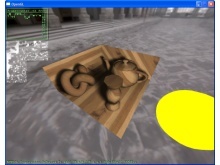 A triangle mesh is parameterized to a 2D texture and illumination information for the surfaces is computed. The parameterization is done by grouping triangles into clusters and projecting them into a 2D coordinate system on the dominant plane of the cluster. To improve the quality of the mapping, care is taken to align the coordinate system to a boundary of the cluster. Then the individual clusters are packed into a single texture using an kD tree based texture packing code. Once everything is mapped and packed nicely, the rasterization starts. It's done by a tweaked version of my software rasterizer. 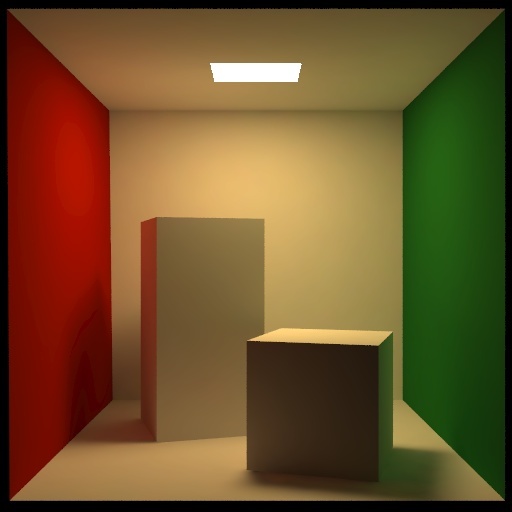 The illumination model used is the diffuse component of Phong shading plus a shadow term. 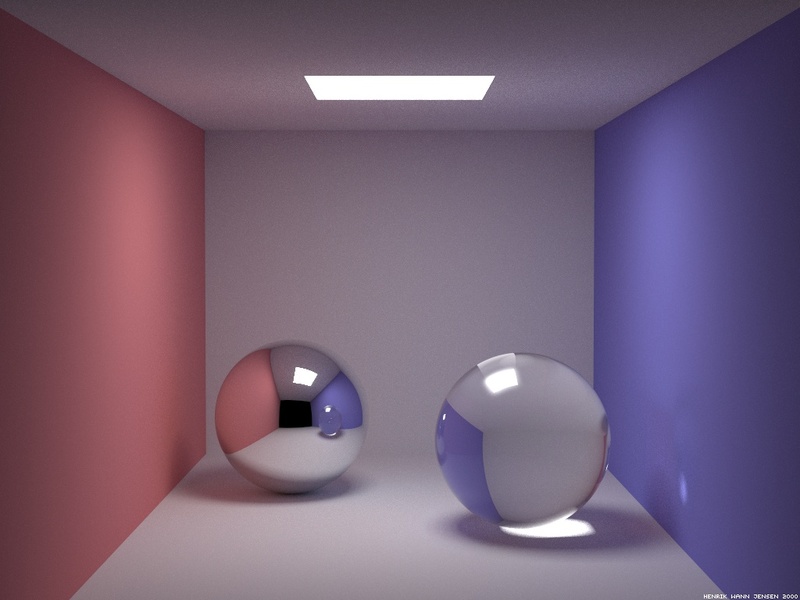 The shadow computations approximate the occlusion of a spherical area lightsource by sampling with a ray tracer. 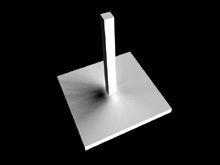 The ray tracing is accelerated through a 3D grid accelerator. The compiler itself is a DLL with a COM style C++ interface and has been licensed for commercial use. A test program for the texture packing algorithm used arrange the triangles in the lightmap. The rectangles are grouped by size because the packing is more tight when the big pieces go first. The white areas are unmapped and would be wasted. 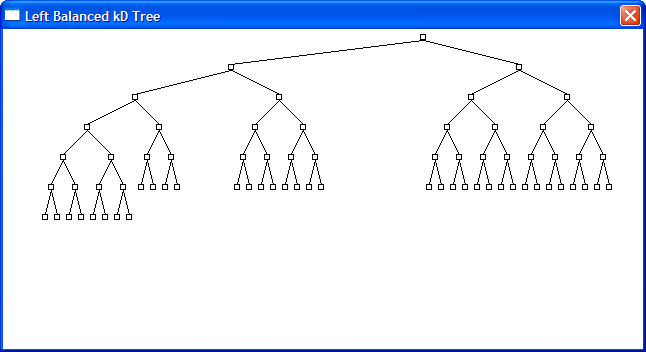 The packing algorithm itself is using a kD tree and is pretty simple overall. Available for Download. 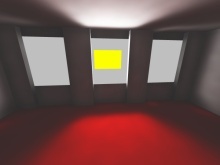 The OpenGL test framework showing a scene illuminated by an area light source. 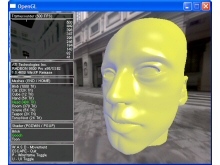 The upper left corners shows a FPS display and the lightmap used for this scene. Using a sufficiently high lightmap resolution and the mapping and rasterization approach described below, this scene with many complex and smooth surfaces can be mapped nearly completely free of seams. 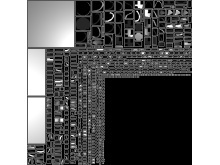 Slices from the 3D grid of the scene above. 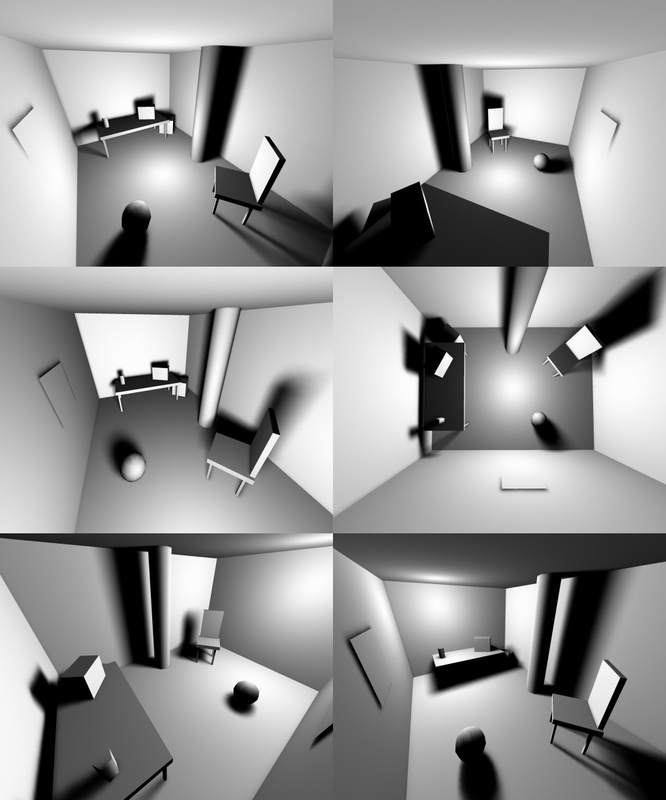 I use the fast 3DDDA algorithm from A Fast Voxel Traversal Algorithm For Ray Tracing. The triangle / grid cell AABB intersection test is this well-known one from Tomas Akenine-Möller. The ray / triangle intersection is from him as well. 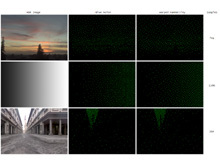 To conserve memory for larger scenes one could use hierachical or projected grids instead. 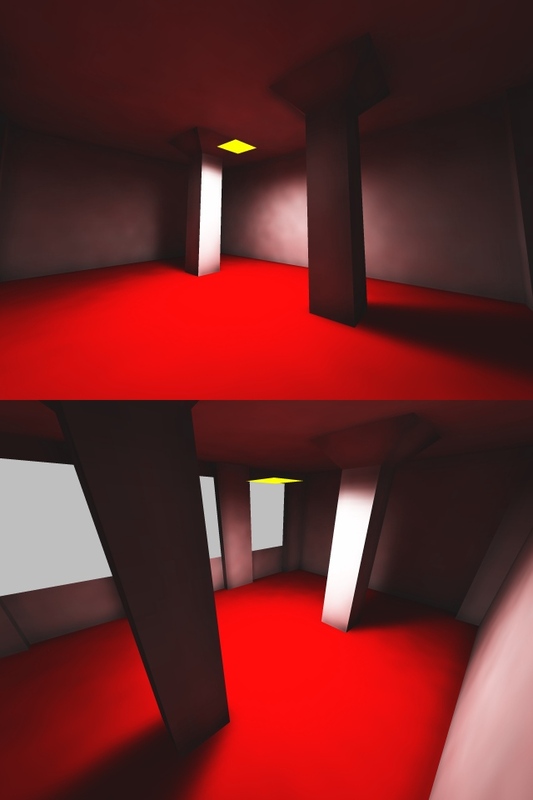 The initial lightmap for the scene above. Cluster AABBs are drawn as white rectangles. Using this lightmap would result in seams and smoothing artifacts. 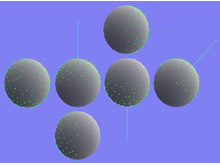 The gaps between the clusters are reserved for smoothing related lumels which are added in the next two steps to fix these artifacts. Here triangles adjacent to the cluster boundaries have been added. Note that they are not actually mapped to the clusters - they are just replicated among adjacent clusters to allow smooth interpolation across cluster boundaries. There is still a gap between the clusters so border preserving filtering algorithms can recognize clusters. As a final step the remaining gaps are filled with pixels taken from the nearest cluster border. 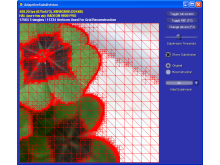 This removes all remaining artifacts caused by MSAA, MIP-Mapping and bilinear filtering. 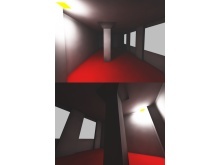 Note that the actual lightmaps are processed with a border preserving blur filter and have shadow information in them. This was omitted for clarity in these three images. 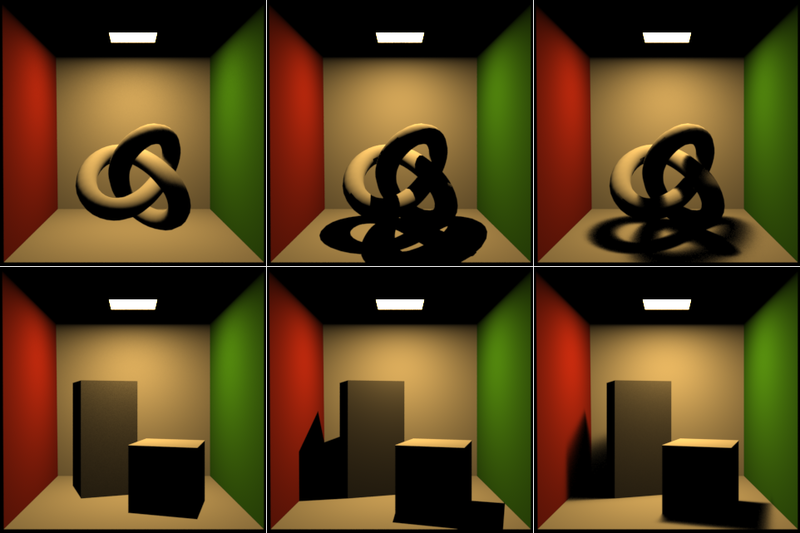 The scene from my shadow volume and per-pixel attenuation demo (Compare). Notice the depth correct soft shadows and the smooth mapping. 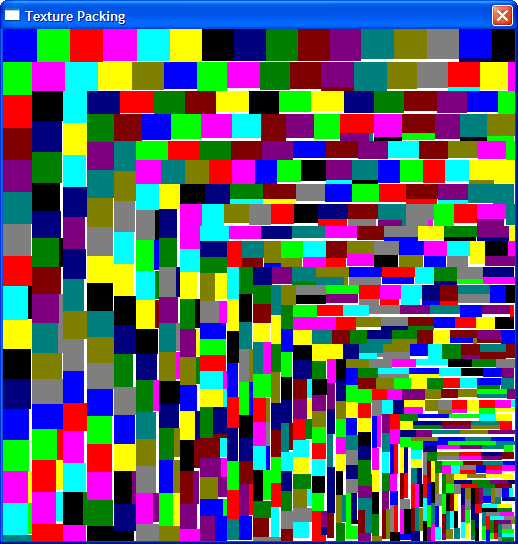 This is a basic C++11 OpenGL viewer application running a ray tracing / marching kernel for each tile in a pool of worker threads. The purpose of this application is to be a test framework for some rendering ideas I plan to explore. The source code for this project is available on GitHub. The GLUT / OpenGL viewing application with custom font rendering. 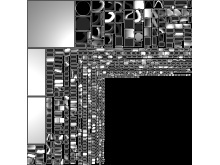 The image is being rendered in parallel tile-by-tile. Some of the test scenes. Mostly used so far to debug intersection / distance test errors, will be used for some lighting and shadow experiments in the future.